Looking to sneak some greens into a delicious dish? 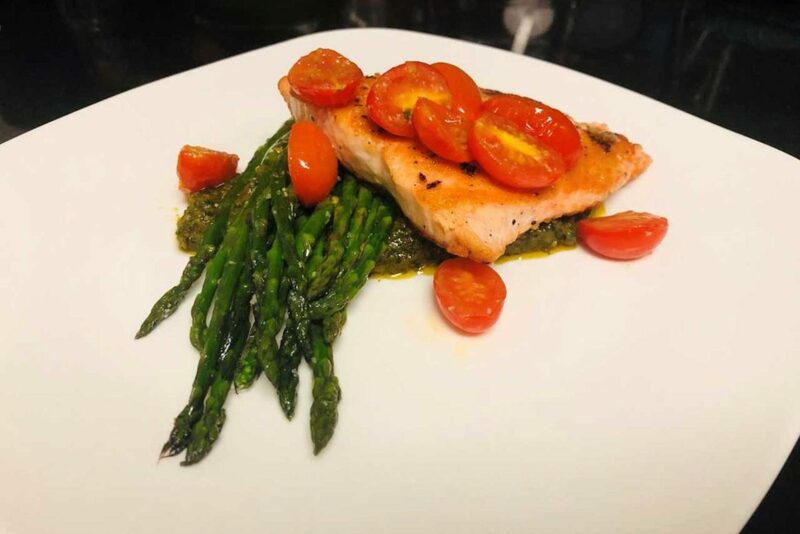 Attune Health nutritionist and research associate Natalie Fortune has the solution – an incredibly healthy and flavorful salmon dish with kale pesto and roasted vegetables on the side. While this particular dish pairs wonderfully with salmon, it could also work well with chicken, beef, or other fish. The beauty of this recipe is that there are endless combinations – find the one that resonates with your taste buds! Avocado Oil is my favorite! In a food processor, add garlic and walnuts and pulse a few times until they are chopped. Now add kale and lemon juice and blend again. While food processor is running, stream in olive oil slowly until the mixture becomes a smooth sauce. Add in nutritional yeast and blend again. Season with salt and pepper to taste. Set aside until salmon and vegetables are complete. Trim the fibrous ends off of the asparagus. Arrange them on a baking sheet. Slice the cherry tomatoes in half and add them to the asparagus. Drizzle 1 tablespoon of oil over the vegetables and season with salt and pepper. Toss to coat evenly.